The venue you're playing at has been undercut by not one, but two, nearby venues. 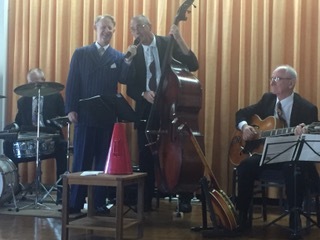 Well, if you're Greg Poppleton at Mosman Bowling Club today, you put on a 'helluva' show for the club and the beautiful people who came to see and hear us. You put on an intimate show - singing to each of the 40 guests individually -from the stage and table by table. You bring people together and get the audience singing. You tell personal stories, weave in an amazing anecdote about a song or two or three, and you sing a request or two that brings a tear to the eyes of the requesters. In short, you create a 'helluva' show with great musicians that makes everyone happy. In fact, everybody left today with a smile and a desire to come back for more. Many left clutching a Greg Poppleton CD sold to them by Bev Evans. A CHILDHOOD HERO. Having a special occasion? 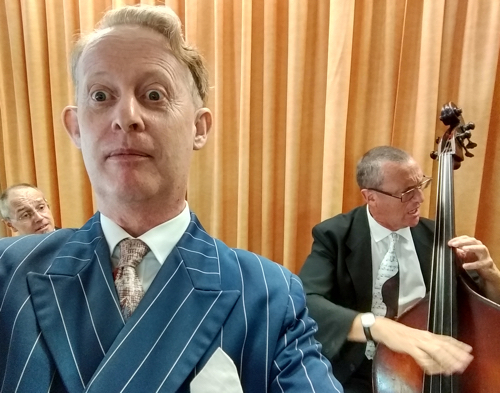 GREG POPPLETON MAKES JAZZ DECO POP! The Copasetic 1920s - 1930s Jazz Singer and Band are absolutely the Bee's Knees. 1.17 Million Total YouTube views. We'll make your special occasion sparkle, too. Enquire now. 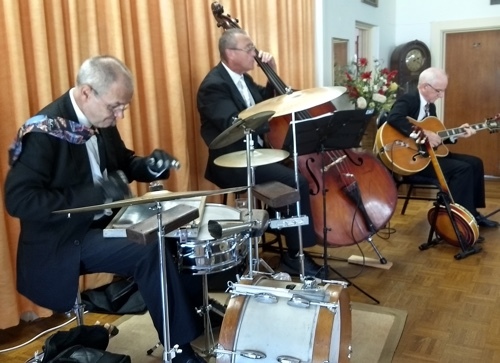 Mosman Bowling Club presents a different top notch jazz band for your enjoyment on the first Sunday of every month, 2 - 4:30pm. And they welcome new players and members, too. Get in touch. A guest photo. Greg Poppleton and Dave Clayton . double bass singing, 'Yes, We Have No Bananas'. Bev Evans was Mrs Sparkle in the Mr Sheen ads. Her talent made the ads hugely successful. As a result, she became Australia's leading hand and placement model. I used to watch Mrs Sparkle on TV as a very little kid and marvel at how natural she was while being incredibly precise in her movements. I've been in 60 TV commercials myself and looking natural while being 'big' as a TVC requires is a rare skill. And I loved the music. Little did I know then that the song was 'Mr Gallagher and Mr Sheen', written in 1922. No, I'm not a 'make-a-quick-buck-off-the-Great-Gatsby-movie' blow-in. I've loved the music of the 1920s and 1930s eversince I first saw Louis Armstrong on TV when I was three years old.